Stomatological Dis Sci 2018;2:6.10.20517/2573-0002.2017.12© The Author(s) 2018. 1Multidisciplinary Department of Medical-Surgical and Dental Specialties, University of Campania “Luigi Vanvitelli”, Naples 80138, Italy. 2Private Practice of Orthodontics, Salerno 84121, Italy. 3Department of Orthodontics, Cranio Maxillofacial Research Center, Tehran Dental Branch, Islamic Azad University, Tehran 11369, Iran. In straight wire pre-adjusted appliances, all the information required to position the teeth in the three axis are included in the brackets placed at the midpoint of the facial axis of the clinical crown defined by the facial axis point (FA). Central to this technique is the bracket placement. The accuracy of the bracket placement can be enhanced with the approach suggested by the McLaughlin Bennett Trevisi (MBTTM) philosophy of orthodontic treatment with the recommended bracket placement chart and the specific bracket-positioning gauges. This chart is only accurate and reliable when all the teeth are ideally proportioned, but this rarely occurs in a dental malocclusion[3,4]. Moreover, the MBTTM approach does not take into account the necessity to level marginal ridges and requires modifications in cases with a deep-bite, open-bite, and tooth extractions. For these reasons, Kalange in 2007 proposed an advanced and more accurate method to achieve precise bracket placement. This method accounted for the eight criteria established by the American Board of Orthodontics (ABO). The criteria are used to evaluate the excellence of the treated cases and coupled treatment objectives with the functional requirements of level marginal ridges, canine, and incisor guidance. To achieve these goals, vertical and horizontal reference lines were traced on working models to create a visual template for bracket placement. However, this method did not fully satisfy the functional requirement to obtain a posterior disclusion during mandibular movements. In a previous publication, a new method to place the brackets accurately on the FA point including the use of a bracket positioner (FAQ.FIX®), and the use of a clinical bracket placement chart was suggested by the author. Following this procedure, it was possible to avoid the most common vertical and angular bracket placement errors regardless of the operator’s skill, even in difficult cases. This angular bracket placement is applicable in both direct and indirect bonding, making this task delegable and standardized. However, to fully satisfy the functional requirement of posterior disclusion during the mandibular movements, specific customization of the indirect bracket placement was needed. Thus, the aim of this technical note and the case report is to describe how to prepare a Customized Bracket Placement Chart and using the FAQ.FIX® previously described, a more accurate bracket indirect placement involving temporomandibular joint evaluations. The construction of a Customized Bracket Placement Chart is related to the ABO, OBI Foundation for Bioesthetic Dentistry and American Academy of Cosmetic Dentistry (AACD) criteria, to get the functional requirements of incisor and canine guidance and marginal ridges alignment[7,9-13]. The OBI criteria are based on the Ideal Human Dentognathic Model (hereafter The Model) described by the gnathologist Lee observing and measuring long-lasting human dentitions with little or no wear, in people over the age of thirty. Lee found his clinical case outcomes to be very predictable, functional, esthetic, and stable more than any treatment he had previously performed by using The Model criteria. Each element has a specific form and function, and the treatment solutions vary considering the human size differences. Thus, the Model provides a solution for treating the dental system biologically and a standard for all levels of therapy, including orthodontics and orthognathic surgery. It integrates the roles of the anterior tooth shape, position and guidance with posterior tooth form, and mandibular movements in order to harmonize the whole tooth/temporomandibular joint complex with the smile and facial aesthetics. Based on the Bioesthetic Dentistry criteria, an overbite of 3-4 mm and an overjet of 2-3 mm are required to achieve proper incisor guidance and support an immediate posterior disclusion. For this reason, if the length of the upper central incisor crown is 12 mm, the crown of the upper and lower canines may measure the same, whereas the upper lateral incisor crown should be 0.5-1 mm shorter in order to not interfere with the cusp of the mandibular canine during protrusive movements. The lower incisor crown should be 2 mm shorter, Although teeth have different sizes, the functional relationships remain the same. In the sagittal plane of the maxilla, the buccal cusp of the first premolar is slightly shorter than the canine, the second premolar buccal cusp is slightly shorter than the first premolar, and the mesiobuccal cusp of the first molar is slightly shorter than the second premolar. These buccal cusp tips form a straight line as will the contact areas and the buccal cervical heights. These three straight lines created by the cusp tips, cemento-enamel junctions and contact areas are not parallel but distally converging to produce better functional tooth morphology and natural esthetics. The arrangement of these teeth forming these converging lines has been referred to as the graduation effect. The final objective is to establish an ideal occlusion with ideal facial esthetics and an orthopedic stable temporomandibular joint position. - Second molar brackets 0.5 mm lower than the first molar. - First/second molar brackets 0.5 mm lower than the premolars. This bracket placement will result in the flattening of the lower curve of Spee. These values will be adequately modified in case of longer or shorter teeth and deep or open bite cases, but the reference will always be the FA point of upper central incisor [Table 1]. The relationship between the teeth must remain constant. - Stone model without the standard bases to allow good visualization of the teeth. - The transfer tray can be completed by the clinician or by a qualified technician following clinician instructions carefully. A 13-year-old patient presented with a malocclusion to be treated with a multibracket straight wire fixed appliance in the upper and lower arch [Figure 4]. A written informed consent was obtained from the patient’s parents for the publication of the patient’s data and photographs. To develop a customized chart, the casts’ analysis was performed to identify the FA point/slot line for each tooth by following the graduation effect and considering the upper central incisors as reference teeth. In the upper arch, both central incisors were 10 mm in height. The right canine was erupting and was 9 mm in height, whereas the left canine had the same height of the upper incisors. The FA point/slot line was determined [Figure 5A, Table 2]. In the lower arch, the heights were 8 mm for all 4 incisors, 9.7 mm for the left canine and 9 mm for the right canine. The lower incisors were 2 mm shorter than the upper incisors, whereas slight differences were noted between the canines and upper incisors. The following FA point/slot line was utilized [Figure 5B, Table 2]. After the customized chart was developed, brackets were placed on the stone model using the FAQ.FIX® and then on the teeth using transfer trays. Following the indirect bonding, 0.014 inches upper and lower NiTi archwires were applied [Figure 6A], and an initial alignment was observed after 2 months [Figure 6B]. A technical note is useful to offer an improved version of an existing technique. In other words, as an advancement on what is currently available providing a solution for some clinical problems with demonstrable practical values. Thus, this paper aimed to describe the construction of a customized bracket placement clinical chart supported by the report of the initial phase of a clinical case. This case report demonstrates the use of a more accurate indirect bracket placement with the FAQ.FIX® to satisfy the functional requirement of posterior disclusion during mandibular movements. The customized placement technique is based on the upper central incisor height which is considered a reliable reference for planning the heights of the upper and lower teeth to achieve esthetic/functional goals. This upholds the principles of the ABO, OBI, and AACD. Usually, when a fixed orthodontic straight wire treatment is performed, the upper central incisor has completely erupted, whereas the canines and premolars may not have fully erupted. Occasionally, the premolars also may be covered by hypertrophic gingiva. The slot lines can be precisely identified using the upper central incisor as a reference, avoiding or reducing subsequent repositioning. In the case report reported teeth 11-21-23-33 almost had the same height while teeth 13-43 were not fully erupted. The customized chart made it possible to identify the correct FA. The advantage of identifying the FA point also may be useful in the case of fractured/abraded teeth. The positioning of the upper central incisors and upper canines at the same height satisfies the functional requirements of the posterior disclusion during the mandibular movements. However, the MBT™ technique does not take into account the necessity for level marginal ridges. This concept was not included in the Kalange technique. In the Customized Bracket Placement Chart the lower canines must have the same FA point of the upper central incisor, so the bracket was located 1 mm higher than lower incisor and premolar FA points. In this manner, the cusp of the lower canine can contact the distal marginal ridge of the upper lateral incisor providing a correct canine guide. Conversely, in the MBT™ and Kalange techniques, the lower canine FA point is only 0.5 mm higher than the upper central incisor and canine. Regarding the molars, Andrews stated that the molar FA point is located at the center of the molar FACC identified on the buccal sulcus. However, clinically the molar FA point is not easily identified and the use of the upper central incisor height along with molar mesial cusp tip as reference might make the location more reliable and easier [Figure 7]. Moreover, the advantage to identify the correct molar FA point also may be useful in case of a not fully erupted tooth or a tooth covered by hypertrophic gingiva. Concerning the upper posterior marginal ridge evaluation, the marginal ridge alignment is essential and requires a complex assessment. 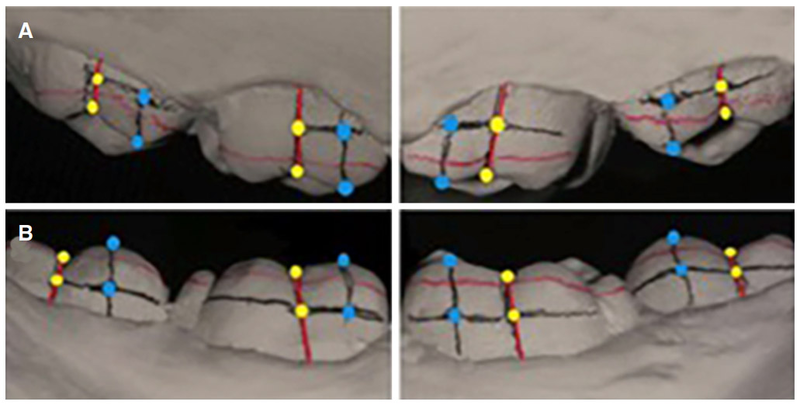 In the Kalange technique, the horizontal red lines passing through the marginal ridges of each posterior tooth should decrease in vertical height in the distal direction, from the first premolar to the first molar. The distance between marginal ridges and cusp tips is 2.5 mm for the first premolars dots, 2 mm for the second premolars, and 1.5 mm for the first molars. Therefore, the FA point should be at 4.5 mm for the first premolars, 4 mm for the second premolars, and 3.5 mm for the first molars. These measurements are easily identified with the customized placement chart avoiding the marginal ridge evaluation [Figure 8A]. Concerning the lower posterior marginal ridges evaluation, the authors identified the slot line of the first premolars at 4 mm. The distance between the slot line and the line connecting their marginal ridges was in the clinical case previously described, 2 mm along the FACC. According to Kalange, transferring this measure below the second premolar and first molar marginal ridges lines to locate their slot lines, the distances from these lines to the cuspal tip of the second premolar and the mesial cuspal tip of the first molar were 4 mm and 3.5 mm, respectively [Figure 8B]. These are the same measurements more easily obtained by the authors using a customized placement chart and avoiding marginal ridge evaluation. These values differed from those of the MBTTM chart, in which premolars are positioned 0.5 mm shorter than incisors and molars 1/0.5 mm shorter than the premolars. Thus, the careful examination of the marginal ridges showed dimensions and proportions that are constantly repeated in the occlusion. Regarding the posterior teeth, the reference will always be the first premolar, the height of which is derived from the height of the canine. The heights of the posterior teeth can be planned in the following manner: (1) in the upper arch, the “degrading progressive guidance in the distal direction” constantly occurs from the first premolar to the second molar. This degradation is shown by the different heights between the tip of the cusps and the line of the marginal ridges; (2) in the lower arch, the distance between the tip of the cusps and the line of the marginal ridges of the premolars is in most cases almost identical, as well as the height between the tip of the cusps and the line of the marginal ridges of the molars. This discrepancy is about 0.5 mm lower than the height of the premolars. To achieve ideal results, an accurate evaluation of the patient’s occlusion from the study models is imperative. The development of an accurate Customized Bracket Placement Chart must be performed by the clinician before the initial bracket placement. Indirect bonding is suggested to provide a precise and faster bracket placement. The FAQ.FIX® was developed to facilitate the ease and accuracy in bracket placement on the FA point to avoid the most common bracket placement errors regardless of operator skill confirming the accuracy and validity of this system. The concepts and suggestions reported in this paper must be considered as useful guidelines to follow before starting an orthodontic treatment with fixed pre-adjusted multibracket appliances. However, some systematic, observational, selection, or positive outcome bias may arise from this methodology. Therefore, the orthodontist has to customize and adapt their evaluation and technique during a fixed orthodontic treatment for each patient. Further clinical research studies may be performed to validate this novel method. A technical note with a case report of a novel method to create a Customized Bracket Placement Chart for straight wire indirect bracket placement with FAQ.FIX® is presented. This methodology seeks to obtain the necessary functional requirements of canine and incisor guidance, level marginal ridges, mandibular movements, and temporomandibular joint movement. Therefore, this method increases the efficiency of fixed orthodontic treatment for each patient at the initial bracket placement. The authors are grateful to Dr. Jon Wagner for the language editing in refining the final manuscript. The patient’s parents signed a consent form to use and publish records and data regarding the orthodontic treatment. An approval from the institutional review board was not required being this study a technical note and clinical case report. Indeed, the authorization to use the patient’s records and data was achieved. 1. Andrews LF. The six keys to normal occlusion. Am J Orthod 1972;62:296-309. 2. McLaughlin RP, Bennet JC. Bracket placement with the preadjusted appliance. J Clin Orthod 1995;29:302-11. 3. Menini A, Cozzani M, Sfondrini MF, Scribante A, Cozzani P, Gandini P. A 15-month evaluation of bond failures of orthodontic brackets bonded with direct versus indirect bonding technique: a clinical trial. Prog Orthod 2014;15:70. 4. Forst D, Nijjar S, Flores-Mir C, Carey J, Secanell M, Lagravere M. Comparison of in vivo 3D cone-beam computed tomography tooth volume measurement protocols. Prog Orthod 2014;15:69. 5. Raucci G, Pacheco-Pereira C, Grassia V, d'Apuzzo F, Flores-Mir C, Perillo L. Maxillary arch changes with transpalatal arch treatment followed by full fixed appliances. Angle Orthod 2015;85:683-9. 6. Kalange JT. Prescription-based precision full arch indirect bonding. Semin Orthod 2007;13:19-42. 7. Casko JS, Vaden JL, Kokich VC, Damone J, Don James R, Cangialosi TJ, Riolo ML, Owens SE Jr, Bills ED. Objective grading system for dental casts and panoramic radiographs. Am J Orthod 1998;114:589-99. 8. Mazzeo F, Marchese E, Assumma V, Sepe J, Perillo L. A new device (FAQ.FIX®) for orthodontic bracket placement in straight-wire technique. Prog Orthod 2013;14:23. 9. Lee RL. Esthetics and its relation to function. In: Rufenacht CR, editor. Fundamentals of Esthetics. Chicago: Quintessence; 1990. pp. 137-209. 10. Dumont TD. Biology of esthetics. J Am Dent Assoc 2009;140:146-7; author reply 148. 11. McClendon JL. Bioesthetic orthodontics. In: Girardot RA Jr, editor. Goal-directed orthodontics. Los Gatos: Roth Williams International Society of Orthodontists; 2013. pp. 539-49. 12. Hunt K, Turk M. Correlation of the AACD accreditation criteria and the human biological model. J Am Acad Cosm Dent 2005;21:120-31. 13. Sardarian A, Danaei SM, Shahidi S, Boushehri SG, Geramy A. The effect of vertical bracket positioning on torque and the resultant stress in the periodontal ligament - a finite element study. Prog Orthod 2014;15:50. 14. 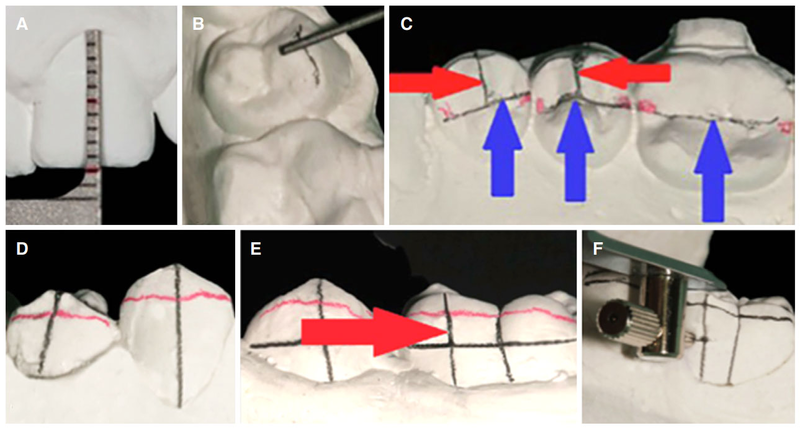 Cortesi R, Molinari L. A simple and efficient procedure for indirect bonding. Prog Orthod 2010;11:180-184. 15. Perillo L, Femminella B, Farronato D, Baccetti T, Contardo L, Perinetti G. Do malocclusion and Helkimo Index ≥ 5 correlate with body posture? J Oral Rehabil 2011;38:242-52. 16. Koo BC, Chung CH, Vanarsdall RL. Comparison of the accuracy of bracket placement between direct and indirect bonding techniques. Am J Orthod Dentofacial Orthop 1999;116:346-51.